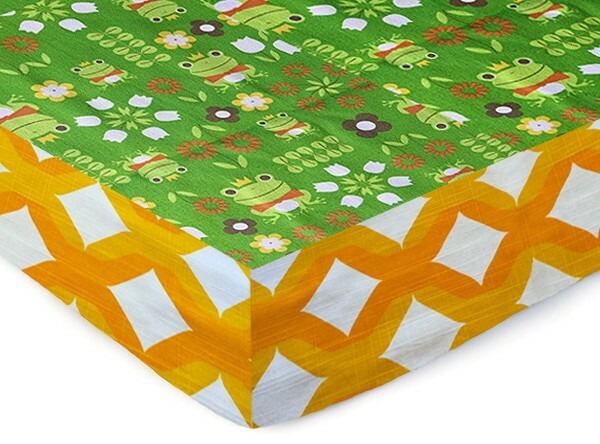 Leap Frog Sheet is on SALE! Crib Sheet, Bumper Free, Baby Bedding, Modern Baby Crib Set, Cotton, Bumper-less, Unisex , Sheet Leap Frog. Introducing our NEW Baby Crib Toddler Sheet that is perfect for the nursery that wants a lot of color but less to provide a modern healthy room for your little one. Beautiful Cotton fabrics make up this ‘Complete Sheet’ design, no need for bumpers or extra bedding to get that finished look. 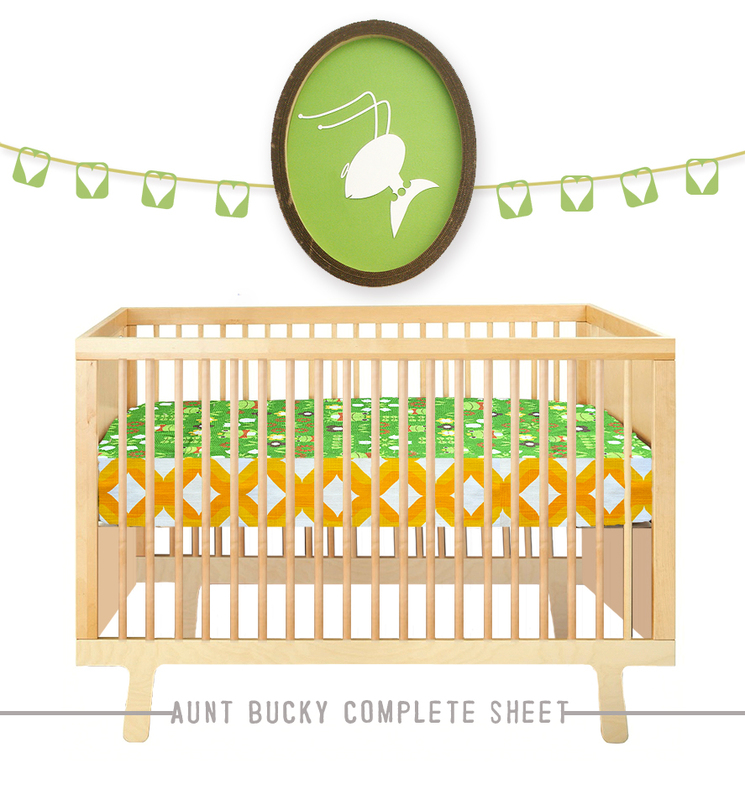 The bumper-free, crib bedding design from Aunt Bucky gives you the integrated design of traditional crib bedding without the bumper. 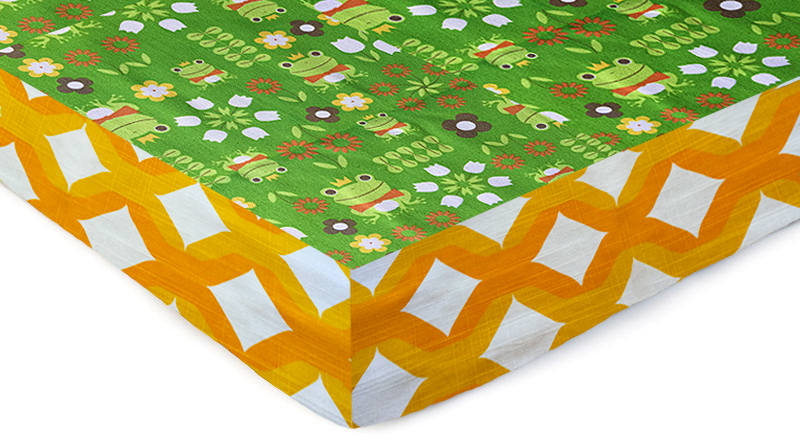 This sheet will make your little one sleep so sound on a cloud made of soft green grass . Sheet will fit all standard crib mattresses. This sheet will also fit toddler beds with toddler mattresses. Designer fabrics with Japanese Leap Frog Kokka fabric design on sturdy cotton top and retro style orange grid heavy cotton fabric on side panels. Fits Crib + Toddler Bed. SKU: AB_LF_CSheet_16. Categories: Babies, Crib Bedding. Tags: Aunt Bucky, Babies, baby beddding, baby shower, boys bedding, Bumper Free Crib Bedding, bumper less crib bedding, complete sheet, cotton crib bedding, Crib Sheet, girls bedding, handmade crib bedding, made in usa, modern crib bedding, modern family, parenthood, pregnancy, toddler sheet, unisex bedding. Leap Frog Complete Crib Sheet is on SALE for $10.00! Leap Frog Complete Crib Sheet is our NEW Baby Crib Toddler Sheet that is perfect for the nursery that wants a lot of color but less to provide a modern healthy room for your little one. This sheet will make your little one sleep so fun with some cool little royal frogs. Sheet will fit all standard crib mattresses. This sheet will also fit toddler beds with toddler mattresses. Leap Frog Complete Crib Sheet is a near-one-of-kind Crib Sheet.